With a painter’s eye, Nancy Anne Miller reveals the complexity of a British semitropical island almost seven hundred miles out at sea. Her use of simile and image metaphor at work in each poem, echo and reinforce the constant comparison of two very different cultures. The reader is in a house of mirrors as each poem turns them into an immigrant traversing a colonial childhood, the surreal trappings of tourism, the effects of weather and ocean on identity, and note a class system where the remnants of slavery still reside. 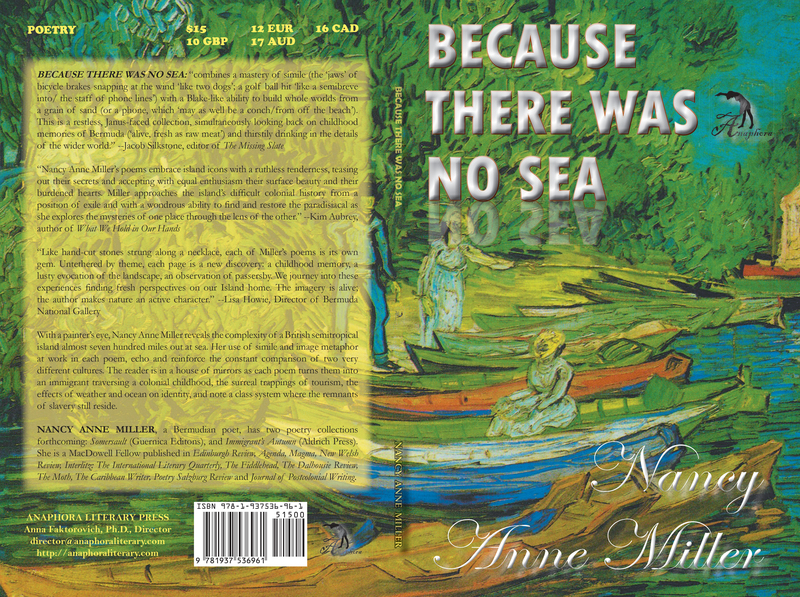 Nancy Anne Miller, a Bermudian poet, has two poetry collections forthcoming: Somersault (Guernica Editons), and Immigrant’s Autumn (Aldrich Press). She is a MacDowell Fellow published in Edinburgh Review, Agenda, Magma, New Welsh Review, Interlitz: The International Literary Quarterly, The Fiddlehead, The Dalhousie Review, The Moth, The Caribbean Writer, Poetry Salzburg Review and Journal of Postcolonial Writing.